Lola’s Math Train, the follow-up to the pleasantly surprising Lola’s Alphabet Train, isn’t quite a game as much as it’s a learning application. In this instalment Lola, the jubilant panda, is here to help kids learn about math, numbers and logical problem solving through various interactive challenges. This is a colourful and cheery experience that’s designed for youngsters aged three to seven, and the aesthetic is inviting enough to win young children over immediately. With the foundation largely remaining the same, anyone satisfied with Lola’s previous outing should find much to like here. Players can choose from three difficulty settings: easy, medium, and hard. 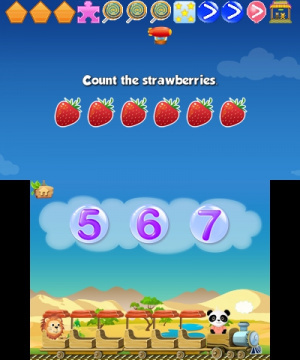 The easiest mode gradually eases children into things by refreshing them on which numbers are which, basic counting skills and distinguishing between numbers and letters of the alphabet. On medium, the lesson is more focused on determining the significance of each number and knowing which is larger than another. 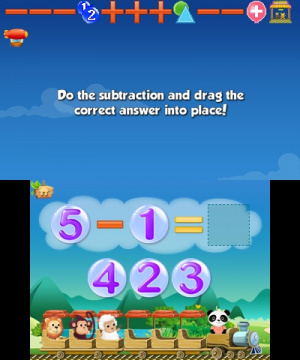 Finally, basic addition and subtraction take centre stage in hard mode. When you select which difficulty setting best suits your skill level, Lola takes command of the train and embarks on a trip to pick up her friends for a party. But, of course, you’ll have to stop and solve math problems along the way. There are six passenger seats available and every time a set of twelve questions is completed, the train will come to a halt and the player can choose which adorable animal buddy they’d like to join their party. This serves as a reward of sorts for completing each area, and children will likely find these characters to be charming – we most certainly did. It’s worth noting that the difficulty seemed to adjust to the skill level of the user. When we scored highly in a couple sections on easy, we were presented with math problems to solve; the times we scored poorly — hey, we’re gamers, not mathematicians — the challenges stayed the same. This is a useful feature that ensures the experience should never be unnecessarily challenging for the younger sprouts. Surprisingly, one playthrough took us about 20 - 25 minutes to complete, and that time could increase significantly depending on the child’s pre-existing knowledge of numbers and maths. 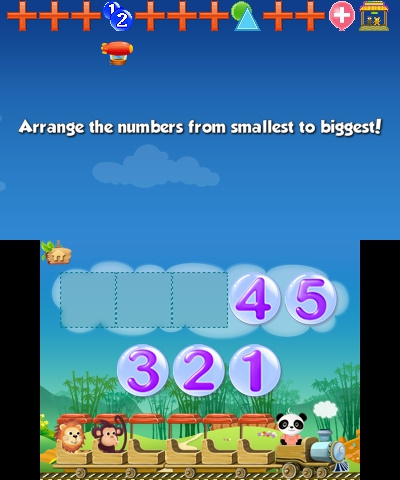 From picking the box with the most squares in it, to solving basic addition and subtraction problems, Lola keeps things varied yet intuitive enough even for children unfamiliar with gaming devices to understand. For example, instead of writing in any answers, a few choices are provided and it’s as simple as selecting or dragging and dropping the options until the correct answer is found. Wrong answers will lead to a lower score; however, ensuring that the user never hits a roadblock wards off any frustrating moments that commonly scare away inexperienced players. The icing on the cake is the fact that Lola’s Math Train features full voice instructions, which even read equations out loud when the correct answer to a problem is found. This is also used to great effect to commend the user on a job well done at every given chance. "You’re so clever", "way to go", "you’re as smart as a panda", and other similar phrases are excitedly cheered, and it seemed to be quite the satisfying experience for the younger gamer that assisted us with this review. That leads us to the most concerning issue with the game, though, which is its lasting appeal. After about an hour and barely completing a full playthrough, our little gamer buddy lost interest in the 3DS altogether and moved onto other things. So, in a worst case scenario, is the content worthy of a purchase? We think so. Even if your child gets a mere few hours out of this experience in total, that’s still a few hours spent learning in a well constructed, charming game. Also, it should be known that even though this is a 3DS eShop release, it's one that's devoid of any 3D functionality, though that's unnecessary considering that the target audience isn't even supposed to view the stereoscopic screen in action. 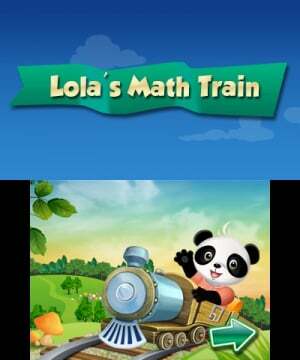 If you’re looking for ways to introduce your young children to a gaming device that provides you with so much enjoyment, Lola’s Math Train is a great place to start. It’s accessible, functions intuitively, and has a charming aesthetic that should be welcoming to children growing up on shows like Dora the Explorer and Blue’s Clues. This is an application for learning, and while it may not offer much lasting appeal, most parents should easily see the value in a purchase. Very good for younger gamers. This was a bit simple for my son, who is 8, but my nephew who is 4 likes it. Seems like a good learning game. I too would like to see more edutation titles on the e-shop. Will be getting this one too. I have the few other kids games, they are around but hard to find. "It said 'I Choo-choo-choose you!' And it had a picture of a train!" Lol indeed! I don't have kids but I do have nieces and a nephew around that age range that could benefit from such a game app. I'll definitely put this one under my radar. MUST HAVE! ..okay not really. Good for the youngsters among us though. Certainly didn't expect this to get an 8. I keep reading this as "Lola's Meth Train." I would buy that in a heartbeat. 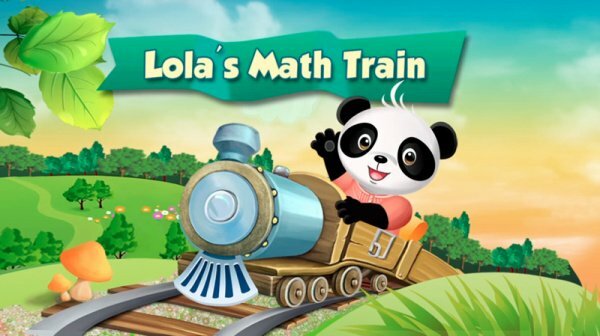 And I just read that as "Lola's Meh Train." I wouldn't buy that in a heartbeat. A good educational game? About time some effort was put in. i bet you some so-called 'gamers' will look at this one and go 'this is kiddy or this is chlldish'. sighs. this looks like one of those games were a lot of time and effort has been put in and the end result turns out well. will recommend this to my young niece.